I never knew PSE had a gang. A gang of some insanely good puzzlers. Know what they do? First they catch you and blindfold you. Then they get you locked up with chains on a steel chair and then they ask you to solve some mysterious puzzle's. Oh, do not ask about the consequences of not solving them! For each passing day, they will put a nail in your finger. Argh! Too insane I say. I heard someone saying, they start giving you clues as soon as they tie you up on that crap chair. I never knew about them until one day, while going on a routine walk, I was caught by such a gang. They took me to some place away from the city. They performed all the rituals as I said like locking me up in the chain on a steel chair. Oh yes, I remember, I was blind folded and hence was only able to listen to their voices. There was only one voice who sounded like the leader and was ordering others. (Voice One) - Shut up! Everyone! Now, listen to me carefully. Hey you! Yes you. Stop playing with it. Place it down and come here. (Voice Two) - Yes Sir! (Voice One) - Also bring down those frozen water cubes. I would like to have a drink. (Voice Two) - Sure sir. (Voice One) - Rest other's. You know what needs to be done right? (Many voices) - Yes Sir! (Voice One) - If not, just follow the pattern of intersecting straight lines. What you call a zig-zag! There was a sudden silence and then my blind fold was removed and I could finally see them. Well, they seem like normal people. Nothing sort of kidnappers. But well, they are! In no time, I was given two of my favorite things. Yes, two Rubik's cubes and a computer. First, solve the Rubik and save your fingers. Next, solve the two notes and save yourself. Get us one name you find using all these and you are on your way! I immediately remembered their conversations and tried to get heads and tails out of it. And it helped me solving the cube. A few placing's on the cube; to be precise, twice on right cube and twice on left cube, and I got something which I thought would help going ahead. But was unsure of what to do with that. Next, I opened the notes. Each of those had a title. I was confused. Why rubik cube with these notes? What's the matter? I tried keeping the cube on the note, tried to wrap it over the cube and all sorts of trials and errors but nothing helped. And then, I remembered the whispers. And well, I was able to get to the root of it. X-mas is around and so are you. No we the first of each will be your way. Note 1 being a little easier, note 2 as expected was a little bit trickier. It consisted of some words and then a note. It took me some time. Phew.. I was somehow able to crack it up. Having solved both cubes and notes, I didn't knew what to do next until I saw the laptop they gave me. With a blink of an eye, I opened it. Used what I found with the cubes with what I found on the notes. And within minutes I was out. Within an hour, I was resting on my couch having a nice cup of coffee. Well well, that was the story. Can you give me the name? Can you save yourself? Go ahead. Do it. It's fun!! 4. The quoted stuff and visuals are enough to find the solution. 5. While the quoted stuff will help solving it, story part serves as an information on how to solve it. 6. Solving this should be a warm up exercise :) Enjoy. 5th December 2016 - Added clarifications which might help. Though I have already covered it up in the puzzle but just for hinting, Rubik Cube(which is already solved) and the two notes have their own independent solutions. Hence, $Step1(Rubik Cubes)+(Step2(Note1)+Step3(Note2))=Final Answer$. It then says, Chances are you might get lost but no we the first of each will be your way. Hence, the first letters are XGCW. forming EV/ENAS/DASH/ODD/ASDOT. Which is EVEN AS DASH ODD AS DOT Ignoring the last line as it says and converting even-length words to dashes and odd-length words to dots gives us a Morse Code. Tranlating it we get MCXR. XGCWMCXR with key TYPE(from Levieux's answer) using Vignere Cipher gives us EINSTEIN, the name we're looking for. Voice one (the leader) is commanding some transformations/rotations to be applied to the cubes. First line (first command): Stop playing with it and put it down, which translates to --> bring down the toy. 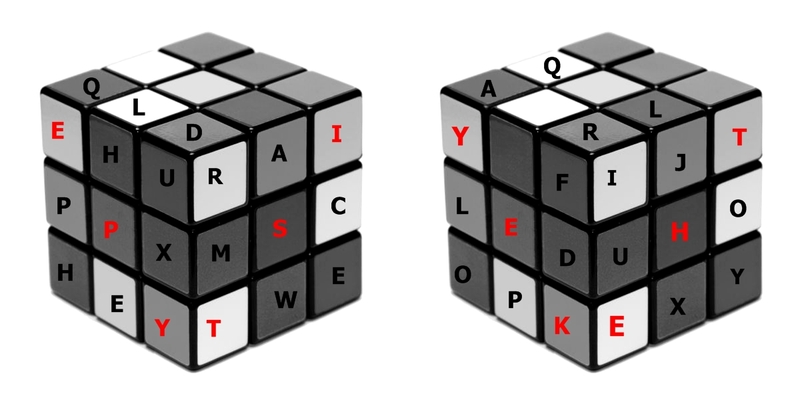 The right cube clearly reads TOY on the top, so rotate the back face of the cube, such that the word TOY is now top to bottom on the right face (brought down). Third line (second command): bring down frozen water cubes --> bring down ice. The same cubicles on the left cube read ICE, so we apply the same transformation here, bringing it down to the right face. Fifth line (third command): Rest others --> don't do anything else. It also states that we know what to do now RIGHT. So perhaps just focus on the right face. Seventh line (fourth command): Follow a zigzag pattern. New updates by Techidiot suggest that on both cubes two rotations need to be done. 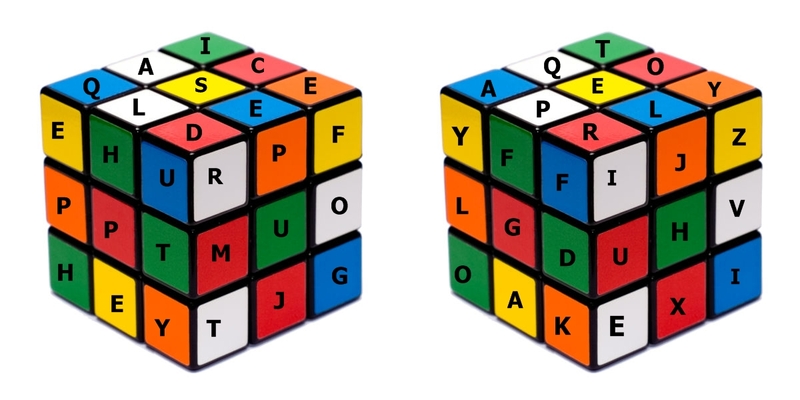 Apparently we have to get four letters from both notes, which, combined with the results from the Rubik's cubes lead to a name. First line: X-mas is around and so are you. --> No idea, around is an "anagram" of "and u r o", 'o' being the "round", but that leads nowhere..
Second line: Arrange using a group of 30 and you will see --> The first line is (including spaces and excluding the final period) exactly 30 characters long. Group of 30 could also refer to the group of international financiers going by that name, but I can't quite fit that in. Another thought that crossed my mind: groups of 30 could be the months containing 30 days: April, June, September, November; exactly four, which is the number of letters we need..
Third line: Chances are you might get lost but --> No idea about this line..
Fourth line: No we the first of each will be your way. --> "No we" is either a typo or refers to the fact that we should somehow exclude "we" from something.. The rest of the line seems to suggest taking first letters. From how this note is built up this could also refer to the first letter of each line, although that might be a little simplistic.. Note 2: I have no ideas about the specific lines, but all of them don't particularly make sense to me, so perhaps they are anagrams (e.g. the word "BRAINWASHED" can be found in the third line) or we should only use their first letters..
Not the answer you're looking for? Browse other questions tagged cipher wordplay story visual steganography or ask your own question.